Open-Tour bus in Vietnam or not? Travelling in Vietnam is very easy as there are a variety of ways to get from one city to another. The trains runs along the coast and stops in major towns and cities. The bus network is extensive and takes you even to the smallest dots on the map. We even saw a group travelling on bicycles. Although there are plenty of options most travellers rave about the Open-Tour bus tickets you can buy from establishments like the Sinh Café. During our travels in Vietnam we considered buying an Open-Tour ticket but in the last second we changed our mind. If you decide to go for the Open-Tour you have to decide where you want to have your stops. Since we were not sure where we wanted to go we did not want to commit to any cities only to find out later that we wanted other destinations. The price for the Open-Tour package is a couple of dollars cheaper than buying single tickets but that is a small cost for freedom. An Open-Tour prepaid ticket between Mui Ne and Dalat costs 5 dollars and a single ticket cost 6 dollars. If you are dead sure about your route then sure go for the Open-Tour but if you hesitate, like we did, then opt-out. Buying single tickets are dead easy as there are several bus companies serving most towns. 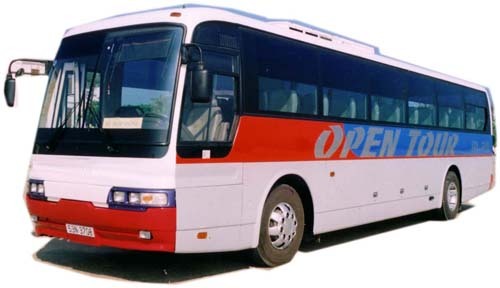 You can even buy single tickets from the Open-Tour companies as late as on the day of departure. Check out our Holiday Price Index for more information. This entry was posted in Vietnam on 2010/09/25 by Trailsurfer.